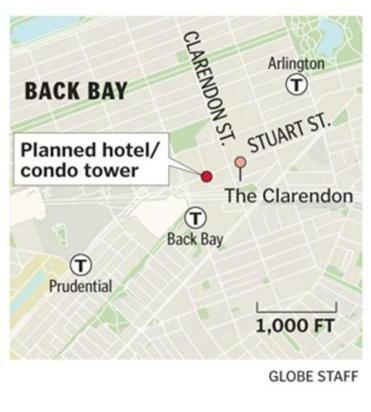 A proposal to build a 33-story hotel and condominium tower in the Back Bay was abruptly pulled from the Boston Redevelopment Authority’s agenda Tuesday amid persistent complaints from neighbors about the project’s impact on wind and traffic. Developer Trinity Stuart LLC requested that a planned board vote on 40 Trinity Place be postponed because it was not advertised long enough in advance of Thursday’s BRA meeting. The mix-up could have given additional legal ammunition to neighbors who continue to object to the proposal. A Trinity Stuart executive asserted Tuesday night that the project — which would rise near the Hancock Tower — has generated significant support among city residents, but continues to draw opposition from condominium owners who live in an adjacent building. The project would result in the construction of 227 hotel rooms and 115 condominiums in a glass tower near the corner of Stuart and Clarendon streets. It would also include several restaurants, including one on the 18th floor with an outdoor terrace overlooking the South End. He and others have raised concerns that construction of such a tall building on the site would add to high winds in the area and make traffic congestion even worse. They are asking for more time to ensure that those effects are being adequately addressed by the developer. “What’s the rush?” said Howard Kassler, chairman of the Neighborhood Association of the Back Bay. “This building is going to be up for a long time, so let’s get it squared away and deal with these nagging issues the community is upset about,” Kassler added. The 40 Trinity building was initially proposed in August 2012, when developers promised it would enliven a desolate corner of the Back Bay. The development team also includes Gary and Jeff Saunders, who own The Lenox Hotel and built the Back Bay Hotel at the former Boston Police headquarters. It is unclear when the project will be up for a final vote before the BRA board. Warshaw said the developers will work with opponents to try to address their continued concerns. But he added that landscaping and traffic upgrades already proposed would be an improvement over existing conditions. “We are committed to mitigation that will not only preserve but enhance the quality of life in this part of the neighborhood,” Warshaw said.